A terrific addition for a new aquarist or for cycling a new tank, the Zebra Danio is an attractive looking small fish, but is also amongst one of the toughest fish available on the market !! Zebra danios are hardy fish and considered good for beginner aquarists. Their enduring popularity can be attributed to their playful disposition, as well as their easy breeding, good looks, cheap price and broad availability. They also do well in schools or shoals of six or more, and interact well with other fish species in the aquarium. Origin : India, Pakistan, Bangladesh, Nepal, and Myanmar. Prefer a planted tank. Add some driftwood plants, perhaps some wisteria or ambullia to help replicate their natural environment. You should consider adding Java Moss, this will be great for when they spawn. Floating plants are suggested and a darker substrate has also been advised. Omnivores, in the wild they eat small spineless species, algae, zooplankton and small worms. In the aquarium they will accept a wide range of foods including flake, micro pellets, bloodworms, algae and brine shrimp. Sexing Zebra Danios is pretty straight forward. Males are more elongated with slightly brighter colour form towards the front half of the body. Females appear plumper with less colour to the front of the body. Gestation time for Danios is three months. A male must be present for ovulation and spawning to occur. Females are able to spawn at intervals of two to three days, laying hundreds of eggs in each clutch. Upon release, embryonic development begins but without sperm development stops after the first few cell divisions. 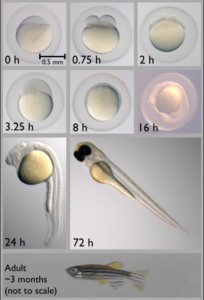 Fertilized eggs almost immediately become transparent, a characteristic that makes danios a convenient research model species. 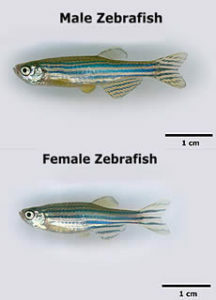 The zebrafish embryo develops rapidly, with precursors to all major organs appearing within 36 hours of fertilization. The embryo begins as a yolk with a single enormous cell on top (see image, 0 h panel), which divides into two (0.75 h panel) and continues dividing until there are thousands of small cells (3.25 h panel). The cells then migrate down the sides of the yolk (8 h panel) and begin forming a head and tail (16 h panel). The tail then grows and separates from the body (24 h panel). The yolk shrinks over time because the fish uses it for food as it matures during the first few days (72 h panel). After a few months, the adult fish reaches reproductive maturity (bottom panel). To encourage the fish to spawn, some researchers use a fish tank with a sliding bottom insert, which reduces the depth of the pool to simulate the shore of a river. Zebrafish spawn best in the morning due to their Circadian rhythms. Researchers have been able to collect 10,000 embryos in 10 minutes using this method. 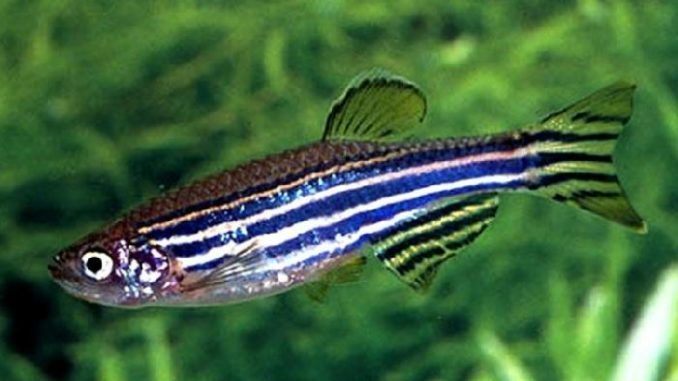 Male zebrafish are furthermore known to respond to more pronounced markings on females, i.e., “good stripes”, but in a group, males will mate with whichever females they can find. What attracts females is not currently understood. The presence of plants, even plastic plants, also apparently encourages spawning. Exposure to environmentally relevant concentrations of diisononyl phthalate (DINP), commonly used in a large variety of plastic items, disrupt the endocannabinoid system and thereby affect reproduction in a gender specific manner. The zebra danio is native to the streams of the southeastern Himalayan region where it is found in parts of India, Pakistan, Bangladesh, Nepal, and Myanmar where it commonly inhabits streams, canals, ditches, ponds, and slow-moving or stagnant water bodies, including rice fields. Zebrafish are most commonly found in low flow streams that has sandy substrates.